Before the start of WW2, Sweden bought licenses from the USA for the production of the Douglas DB-8 (A-17) bomber aircraft. The Swedish production version vas highly modified. The chosen power plant was the Bristol Pegasus. 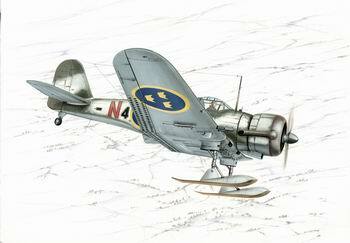 Other differences included a different undercarriage, pilot’s canopy hood and other details. The aircraft served throughout the whole war as the neutral state’s aircraft never participated in combat.The Hi-Tech version kit consists of two sprues with plastic parts and a huge load of resin parts. Further the kit contains injected canopy, vacform canopy and colored photo-etched parts. The kit offers all three undercarriage versions, wheeled with or without aerodynamic spats and ski landing gear. Decals offer a choice of three machines, winter and standard camouflage and a natural metal finish machine.